As prevously mentioned, I’ve begun the Seeburg jukebox model 146 restoration project. Since the cabinet is in fairly good shape, I’ve wanted to only fix the various blemishes instead of stripping and refinishing the whole thing. It turns out that stripping is not even an option. Even though the cabinet is mostly wood, they used a faux wood-grain on everything. This realistic looking walnut burl has been printed directly onto the wood, probably using a silkscreen. It’s been a real challenge to find stains and paints to match the existing finish. The color shades are different on various parts of the jukebox. In addition to that, these days many stains and paints are not compatible with each other or with various topcoats such as lacquer or polyurethane. For example I found a set of stains from Old Masters that match closely to the shades used on the jukebox, but it turns out they blister when I topcoat them with lacquer. Polyurethane doesn’t cause this problem but I prefer to use lacquer. Polyurethane doesn’t cure entirely hard which makes it difficult to rub out imperfections in the final finish. Another drawback is it tends to yellow with age. 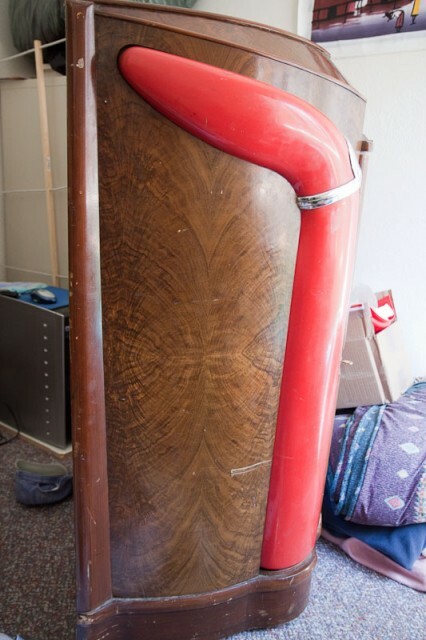 Lacquer was originally used on this jukebox. So it’s been a bit of a slow start while I tested all of the combinations of paints, stains and topcoats. Zar stains are compatible with lacquer but I have to blend the colors myself to get the right shade. See all posts related to this jukebox.